In the U.S., roughly 80 percent of adults live close to the poverty line. Our programs are specialized to help heal the mind, body and soul for adults in every stage of life. We partner with adults by connecting them with tools and resources to help them through any life struggle. Our services - such as our adult day centers, education and skill classes, help for veterans, community care ministries for those who are homebound or hospitalized, counseling and more - give people a whole army of support so they know they're not alone. An estimated four out of five adults struggle with near-poverty, joblessness, or dependence on welfare. While much of social service work highlights young people of color who are in need, many of the faces we do not see are often adults and seniors in suburban or rural areas dubbed the “invisible poor,” where 60 percent of the poor are white. Regardless of who you are or where you are from, we're here to help. Adults of all ages have full access to our basic needs services at any time. In some areas, we even have medical and dental clincs to enhance the support we can offer adults who are living at or below the poverty line. For older adults, we have mid-day meals, transportation help, older adult ministries, and even special housing facilities in some locations. We help individuals overcome qualification barriers though pursuit and completion of educational requirements, training, certifications and other prerequisites for gainful employment. Additionally, we help those suffering from mental illness or substance abuse pursue the treatment and/or mediation they need to function as healthily as possible. Engaging the minds and bodies of older adults helps keep them young, active and happy. At The Salvation Army, older adults can enjoy educational classes, kindle friendships over lunch, relive their youth with dances, take pre-retirement seminars and countless other activities. Mental and physical problems can take a toll, not only on the person experiencing them, but on their family and providers as well. Knowing this, The Salvation Army provides adult day programs where adults 18 years and older who are unable to take care of themselves can enjoy activities and friendships, while their providers are given the opportunity to take care of other life matters for a few hours. Our trained staff and social workers develop a plan of care for each individual. In addition to the mental stress of past service, veterans with post-traumatic stress disorder (PTSD) also often struggle with drug and alcohol addiction. Through the faith-based recovery and work programs at our Adult Rehabilitation Centers, those veterans can begin to mend their broken lives and return once again to their families. Additionally there are programs established in some communities specifically to meet the unique needs of Veterans. We not only meet physical needs, but we heal souls through our spiritual ministry – by sharing the love of Jesus Christ and the promise of salvation. We want to help you explore what it means to have a personal relationship with God. Salvation Army Worship and Service Centers are a church home to many on Sundays, but we also offer men's and women's Bible studies during the week, group prayer meetings, pastoral counseling and even special group counseling for those facing similar hardships at some locations. Of the many challenges that face those who are homebound, hospitalized or in a constant-care facility, feeling forgotten by the loss of contact with friends and family is the biggest. Our Community Care Ministries go to them — friendship and encouragement right in their homes. We also visit those in hospitals, nursing home or other institution. This social ministry offers visitation, celebration planning (such as birthdays or holidays) and Bible study. We care for each individual deeply and would love to spend time getting to know you or your loved one. For men and women in prison, those about to be released or those freed after serving time, compassion can be the difference between a new life path or repeat incarceration. Our staff members minister to victims, offenders and their families. We work to restore individuals to their rightful role in society through our correctional services program. We offer Bible correspondence courses in many languages to those in prison, where they can learn about the Bible. Additionally we connect prisoners with old-fashioned pen pals. Adults primarily make up our volunteer workforce. Do you want a place where you can help other people? Do you need a place to belong? No matter your age - whether working full time, between jobs, or retired - we have a place for you. Stop by your local Salvation Army or look for volunteer opportunities. Help adults and seniors find dignity and purpose. God loves every person at every age. Roughly 35 million U.S. adults have reading skills that are below a fourth-grade level. Your donation to The Salvation Army supports programs for adults to learn, grow, and feel God’s love in a supportive environment. Donate now. Studies revealed that seniors aged 50 to 60 who were socially active had slower rates of declining memories. 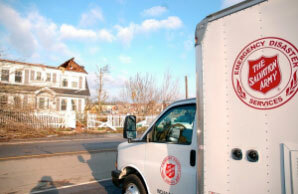 Your donation to The Salvation Army supports visits to homebound senior citizens. Donate now. Dementia touches one in seven Americans over the age of 71.